In 1933 a small headline appeared in the Toronto Daily Star, Bearded Man Seen In Casket Window. T he article goes on to state the discovery of a cast iron casket in an older section of Oshawa’s Union Cemetery. Workers digging a grave in the section of the cemetery formerly known as the Presbyterian burying ground struck a cast iron surface with their pick axes. According to the newspaper article, further digging revealed a grey iron casket complete with a plate glass viewing window. As the workers peered into the viewing window, they were surprised to see the bearded face of the corpse looking back at them. Although not unheard of, cast iron caskets were rare due to their relatively high price compared to the more reasonably priced pine coffins. Almond Dunbar Fisk, an inventor, patented his “air-tight coffin of cast or raised metal”, known as The Fisk Metallic Burial Case, in 1848. Fisk’s coffin was unusual for its shape; custom formed to the body and resembling an Egyptian sarcophagus. The airtight caskets were convenient for preserving remains that were to be shipped far distances. Fisk started to produce his coffins in 1849 in Rhode Island and later in Long Island, New York. A disastrous fire destroyed Fisk’s foundry, tools and machinery. Fisk’s bad luck continued into 1850 when he was unable to continue work due to failing health and transferred his patents to investors. 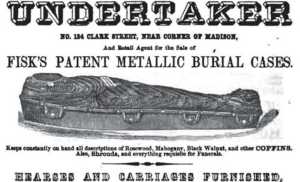 The business name was changed in 1877 to the Metallic Burial Case Company and finally ceased production in 1888. The newspaper article does not make any mention if the lead coffin uncovered in Union Cemetery was indeed a Fisk model however it is a reasonable assumption that it was. Because they are sealed, cast iron coffins tend to yield well persevered bodies hence the comment about the “bearded face of the corpse still intact.” A Fisk casket opened at the National Museum of Natural History in Washington contained the well preserved remains of a young male that resembled an ancient mummy, even though he had not gone through the Egyptian embalming procedures. (NBCNews.com August 4, 2005) . Another clue would be the that the casket was believed to have been shipped here from the southern section of the United States.” The Fisk caskets, as air tight, were handy when remains had to be shipped over long distances. If the burial did indeed take place 88 years before that would be in harmony with the manufacturing of the Fisk caskets. Unfortunately we will never know who the beaded corpse was or if the cast iron casket was indeed a Fisk model. The newspaper of the day nor the people involved never recorded any additional information. What we do know is the undertakers found the casket unusual enough to be noted and cleaned. The newspaper article notes the iron casket was replaced and the grave once again filled in leaving us with many unanswered questions.